Ama is a unique concept devised by a sage who used Ayurveda as a medical science thousands of years ago. As of present no other system is aware of it. Any substance or chemical element that we take in with our food and drink or through breathing needs to be processed inside the body. This process is called digestion. Digestion separates what is useful for the individual from the rest which is waste, ready for elimination. When the digestive fire (Agni) is weak or not active enough, the food or drinks that we take in are normally in excess of what can be handled, so the result is improper digestion. It is therefore impossible to separate the beneficial ingredients from the waste. This condition of indigestion can be compared with an unripe fruit, where it is difficult to separate the juice from the pulp. In simple words, unripe and uncooked is known as Ama. The Ayurveda sage used the same term to highlight the importance of proper digestion before ingesting any new food, drinks or medicines. As each and every cell and tissue inside the body are constantly replenishing themselves thanks to digestion, Ama can affect them all. Ama is an essential factor in the development of any pathology. Ama is a term denoting a product that is an undigested form derived from food that gets absorbed into the system without proper assimilation. Such partly digested material cannot be used by the system, and acts to clog it, eliciting an immune reaction. The formation of Ama is the first stage of energy vitiation. It can accumulate in different parts of the body. Due to diminished digestive fire (Agni), the first dhatu, namely Rasa, does not form properly so it remains in the Amashaya (stomach) for a long time and undergoes fermentation. This state of Rasa is creating Ama. If the Vata, Pitta and Kapha doshas get mixed wrongly, that leads to the formation of Ama dosha. Improper nutrition and emotional stress contribute to the formation of Ama. Food soaked in too much water. Ama are toxins within the body. Due to Ama, food components remain undigested and unabsorbed. They accumulate in the large intestine, turning into a heterogeneous, foul-smelling sticky substance. Ama clogs the intestines and other channels such as capillaries and blood vessels. It eventually undergoes a number of chemical changes which create toxins. These toxins are absorbed into the blood and enter the general circulation. They eventually accumulate in the weaker parts of the body, where they cause contraction, clogging, stagnation and weakness of the organs, and thus reduce the immune mechanism of the respective tissues. The root of all disease is Ama. Doshas, Dhatus, and Malas influenced by Ama are called as Sama dosha, Sama dhatu, and Sama mala, respectively. Those not affected by Ama are known as Prakruti, Niram dhatu, and Nirama mala, respectively. Pain in the joints and all body parts. Use hot, pungent, dry Ayurvedic products such as Guggul (resin), dry fomentation e.g. powder massages, and Niruha Basti (medicated enema with herbal decoction). Use bitter Ayurvedic products such as Amrutha and Nimba. The signs and symptoms of Sama Dhatu are specific to the respective dhatus and are observed independently. Sama Dhatu lose their normal properties and functions due to obstruction by Ama at the cellular level. Nirama Dhatu are normal structurally and functionally. No (or very weak) smell. The first and most fundamental treatment of Ama is Langhana (Fasting) until the digestive fire (Agni) becomes normal. It then reduces the obstructions in the channels and digests the Ama, reducing all signs and symptoms produced thereby. 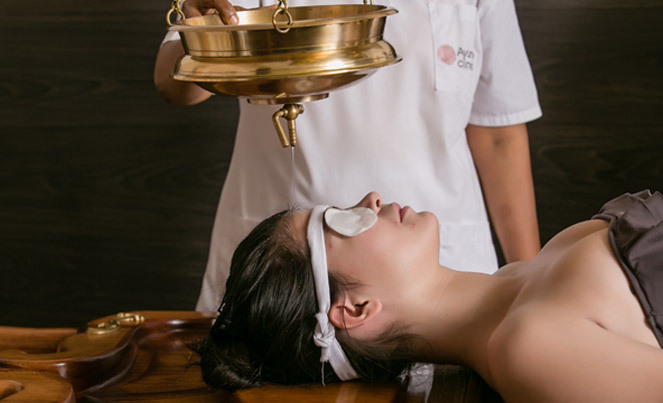 Dry sudation therapy is the second line of treatment in which the Ayurvedic therapist uses textile bags filled with sand. This therapy relieves the obstructions in the channels as well as the pain and swelling. Panchakarma – similarly to Vaman and Virechana, these procedures should not be done in a Sama condition. Treatment begins with Deepan (Appetizers) and Pachan (Carminatives), and only then can detoxification be performed. Weak Tissue Fire – also causes defective tissue metabolism. This leads to the formation of Sama Dhatu. There are decoctions of herbal mixtures to treat this Ama at the tissue level. They are called Rasa Pachak or Kalingakadi Kadha, Rakta Pachak or Patoladi Kadha, Mansa Pachak or Patol Nimbadi Kadha, Medipachak or Kirat Tiktadi Kadha, Asthi Majja Pachak or Dhatryadi Kadha. Ama due to exogenous causes – when microorganisms such as bacteria, viruses, fungi etc attack the body, they also create Ama, which modern science calls infection. Herbs such as Guduchi, Nimba, and Turmeric are best for treating these Ama conditions. Accumulation of waste products – waste products such as urine and stool, as well as waste generated during tissue metabolism, should be excreted from the body at the proper time, and in a proper quantity and way. If waste products accumulate in the body, they act like Ama or endogenous toxins. For example, if a person suffers from kidney failure, urea (a waste product during protein metabolism) should be thrown out otherwise a serious condition called uremia occurs. So, in this case urea acts like Ama. Ama accumulation at the subtle level – negative thoughts in the mind such as excess lust, anger, greediness, manifestations of the ego, jealousy, etc. are also responsible for the formation of Ama at the psychological level. This Ama blocks the proper thinking process. Common manifestations include psychological problems such as anxiety, depression, schizophrenia, etc. Ayurveda believes in the intimate relation between body and mind. Hence, this subtle Ama can cause a number of psycho-somatic illnesses such as peptic ulcers, bronchial asthma, allergies, etc. The Free radical concept of modern science is part of the Ayurvedic Ama concept – free radicals are atoms, ions or molecules, which have free electrons. They are formed as a result of air, water, food or sound pollution. Free radicals attack healthy tissues and can cause serious problems such as cancer. The Ayurvedic Rasayana (rejuvenation treatment) can prevent the formation of free radicals. An Ayurvedic Vaidya can diagnose Ama by observing certain clinical features and also examining your tongue and pulse. In case of an Ama condition, the tongue has specific coating and a loss of proper taste perception has occurred. The pulse will be Sama Nadi and feel heavy, too fast or too slow, or irregular. Patients with Ama will have fever while their blood will have a high white blood cell count or an abnormal level of immunoglobulins such as IgG or IgM.